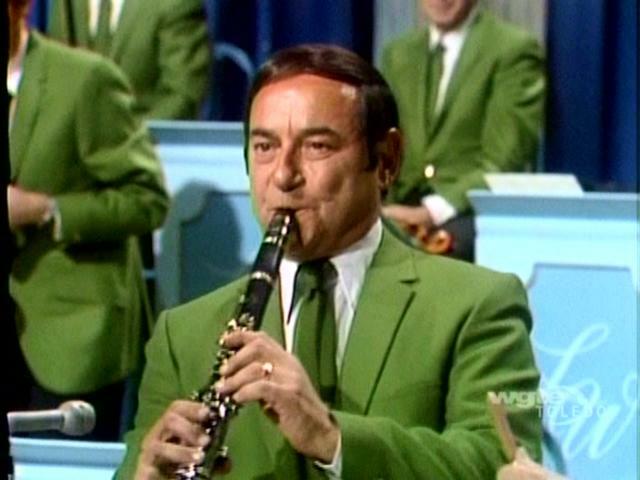 Peanuts Hucko performed on the Lawrence Welk Show from 1970 to 1972, having built up an impressive background playing with Glenn Miller during WWII and Louis Armstrong. Michael Andrew Hucko was born April, 7, 1918, in Syracuse, N.Y. He picked up the nickname Peanuts because of his size when he started playing saxophone at age 11. In 1942, he went into the infantry, but Glenn Miller wanted him in his Air Force band and got congressional approval to transfer him. It was Miller who suggested that Mr. Hucko change from tenor saxophone to first clarinet. 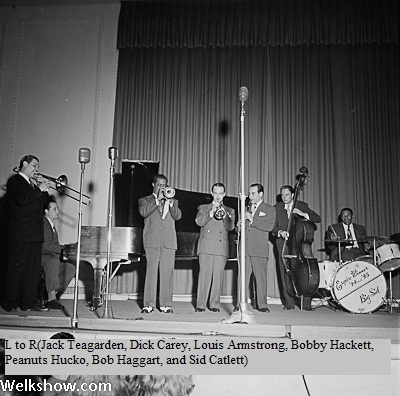 Hucko continued to play with the band after Miller's disappearance during World War II, then joined Louis Armstrong's All Stars and worked as a studio musician for CBS and ABC. Shortly before moving to Denver in June 1967, Mr. Hucko called a female singer and offered her a job performing with him six nights a week in the Navarre at 1727 Tremont Place. The singer was Louise Tobin, and by opening night, they were already married. Hucko and his wife opened the Navarre, a popular jazz club and restaurant in Denver in 1967 but decided to sell it in 1969. Hucko was then hired by Lawrence Welk in 1970 to replace Mahlon Clark, who had left in 1968. After leaving the show in 1972, he was replaced by Henry Cuesta. Hucko moved to Denton, TX, his wife's hometown. In the 1980's, he toured with his band the Pied Pipers. Late in 1991 he toured Europe and the UK, leading a small band which included Glenn Zottola and Roy Williams in its Anglo-American ranks. Hucko died of pneumonia in 2003 at the age of 85 in Forth Worth, Texas.